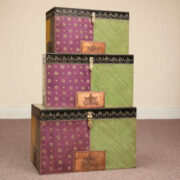 Beautifully distressed sea green trunk sourced from colourful Rajasthan, India. 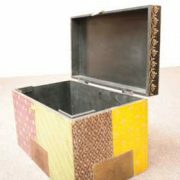 With its slightly gawky lid, this charming vintage trunk is a real favourite here. Fairly lightweight, the trunks original sea green paintwork shows signs of age and wear giving it a beautifully distressed look as patches of wood grain subtly show through. 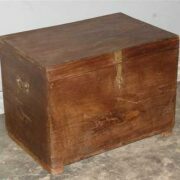 The trunk has its original lockable metal clasp and an internal chain to hold its lid open in place. 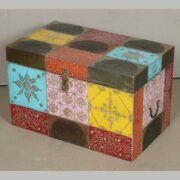 We’ve no doubt this cute trunk will find a suitable home soon, it would be at home in a bedroom, landing or living room. 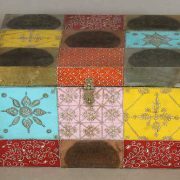 VINTAGE INDIAN FURNITURE AND ACCESSORIES – Take a look at our blog about this style of furniture here.